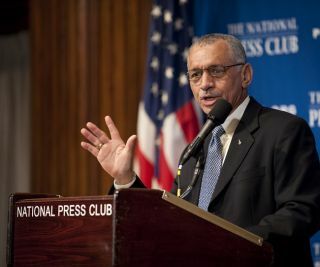 NASA Administrator Charles Bolden speaks during a press conference, Tuesday, Feb. 2, 2010, at the National Press Club in Washington, where the it was announced that NASA has awarded $50 million through funded agreements to further the commercial sector's capability to support transport of crew to and from low Earth orbit. NASA chief Charles Bolden told senators Wednesday thatsending astronauts to Mars is still the ultimate goal for U.S. humanspaceflight, as he defended the agency?s newspace plan against criticism in a heated budget hearing. ?Mars is what I believe to be the ultimate destinationfor human exploration in our solar system,? Bolden told the Senate?s Commerce,Science and Transportation subcommittee. But NASA will likely not have the technology to send astronauts to Mars for at least the next 10 years, he said. ?There are too many capabilities that we don?t have in ourkit bag,? Bolden said. That?s where the NASA?s 2011 budget request comes in, Boldensaid. It sets the stage for futuremanned spaceflights to the moon, asteroids and Mars, by focusing on the technologiesneeded to explore beyond low-Earth orbit faster, he added. But Bolden?s comments were met with criticism and, at times,open hostility from some committee members and experts because the new budgetrequest effectively canceled NASA?s Constellation program, which wasbuilding new rockets and spaceships capable of returning astronauts to themoon. Without a successor to the space shuttle, NASA will losetalented engineers from layoffs and attrition, which poses a threat to theUnited States? prowess in human spaceflight, former shuttle commander Robert?Hoot? Gibson told the committee as part of a later hearing with a panel ofspace experts. ?With the retirement of the space shuttle later this year,and if the administration?s proposal is followed, the United States will nolonger be a space-faring nation,? said Gibson, who flew on five shuttle missions before retiring from spaceflight in 1996. While Bolden said Mars is a goal, NASA and the Obama administration have yet torelease an official outline for future destinations. That officialspace plan could take months, agency officials have said. ?You don?t accomplish great things without a clearly definedmission,? said Sen. David Vitter (R-Louisiana). ?And this budget has no clearlydefined mission.? NASA?s 2011 budget request, released Feb. 1, sets aside $19billion for the space agency for next year. It is a slight increase from the2010 budget, and included a life extension through at least 2020 for theInternational Space Station, as well new funds for space technology developmentand basic scientific research. But President Obama?s budget assures the retirement ofNASA?s shuttle program in the fall. In place of NASA-built spaceships toreplace them, the budget request would set aside $6 billion over the next fiveyears to support the development of commercialspaceships capable of launching American astronauts. Sen. Bill Nelson (D-Florida) agreed that President Obama andNASA need to state a clear goal. But the agency must also work to be sure itdoes not trade astronaut safety for commercially built spacecraft that arecheaper and faster to produce, he added. ?The shift to commercial spaceflight cannot come at theexpense of astronaut safety,? Nelson said. NASA?s three aging space shuttles are due to retire inSeptember after four final missions. After that, American astronauts will bedependent on Russian Soyuz spacecraft to reach the InternationalSpace Station during the gap between the shuttle program and when newspacecraft come online. That gap, Vitter said, is unacceptable and will erode theUnited States? claim as a leader in space exploration. ?I will fight with every ounce of energy I have to defeatthis budget or anything like it,? he added. Vitter asked Bolden how he explained the looming gap, andsubsequent job layoffs, to NASA employees who will lose their jobs when theshuttle fleet retires without a successor program. Bolden, known for his emotions, teared up. ?I can tell them, as I have, that I?m going to do everythingin my power to try to make sure that we develop some programs that are going toget to where we all want to go as soon as possible,? Bolden said. That includes funding research into new technologies,including ones to combat radiation and health effects for deep space missions,and others that have the potential to shave months off manned trip to Mars, headded. ?We are oh so close,? Bolden said. ?But we are not thereyet.? Video? What?s Next For NASA?